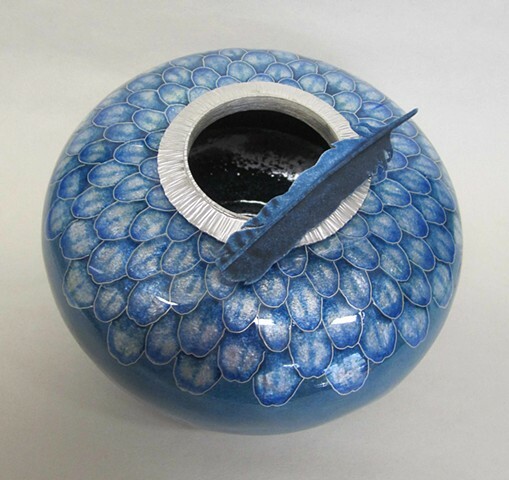 The Blue Jay Vessel series of vases are enameled with a feather pattern in the colors of this perching bird, a native of North America. The outlines of the feather pattern are fine silver cloisonné wires separating transparent enamel over silver foil. Across the lid is a blue jay feather cut from silver & then fired with a coat of enamel that is then etched to achieve a matte surface. Blue Jay Vessel #3 is available in various sizes, the one being featured in this online portfolio being the largest of those sizes. Each piece is hand-made by the artist & has its own distinctive features.